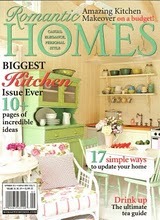 If you didn't know, there is a chance to feature your home in the Holiday 2010 addition! Click the link for more information!!! I am so excited about this! I just pre-ordered my own copy of this--remember that it is only available on there. I plan to enter this contest! Wish me luck--and good luck to all who enter! I can't imagine how awesome it would be to have Matthew Mead and crew come and take over my house for a few days and gussey it all up for Christmas! That would be so wonderful. In fact, last year I started decorating for Christmas in August! I just couldn't wait, as it was going to be my first Christmas in the house--I know, 4 months early...eh...I'm strange, what can I say! Fa la la la la la la la laa......! To inspire all of you out there, here are a few photos from last Christmas at my house. Check back in July for a full fledged post on Christmas for my Christmas in July posting! A festive Pretty in Pink Christmas Tree from Treetopia! Santa Claus is Watchin' You! A few vintage Anna Lee figurines. A lovely silver and cream tableau. I just love all the bottle brush trees! And a little touch of woodland! I hope after all of this HOT weather we've been having here, that this will cool you down!